Those who have long been looking for signs of extra-terrestrial life will be clapping their hands with glee over a video that was taken by the International Space Station. The video may be the thing that proves they are right as it shows a strange formation, which many have said is an alien craft with the name of the Black Knight Satellite. The image captured by the International Space Station is not crystal clear, but the again they never are, but it has enthusiasts arguing that it clearly shows the Black Knight Satellite shape. This is an alien vehicle that is enigmatic and one that has been creating a buzz throughout the last couple of years. The Black Knight Satellite is said to be the most famous of space objects that are orbiting planet Earth. The artificial satellite has been the cause of much interest in the media and it has been since the late 1950s. It has also become one of the space objects that have been the most talked about. 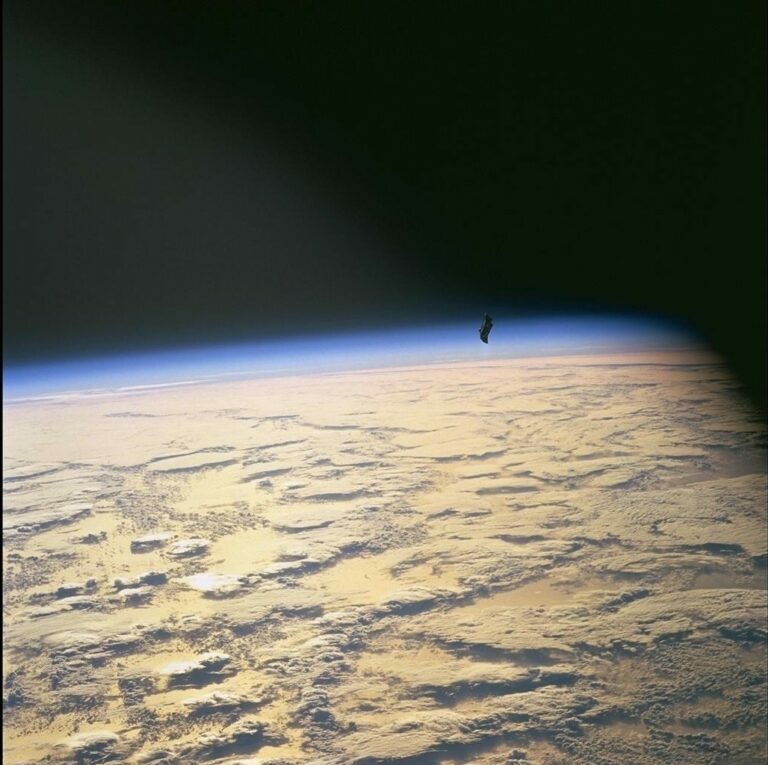 It was first suggested that the Black Knight Satellite might have been a spy satellite from Russia and it has held the interest of millions of UFO seekers around the world. The Black Knight first came to light in the media when the San Francisco Examiner and St. Louis Dispatch wrote about the Satellite on 14 May, while Time Magazine went with a story of 7 March 1960. Ufologists have said that the satellite is alien and it has been keeping watch over Earth for 13,000 years. 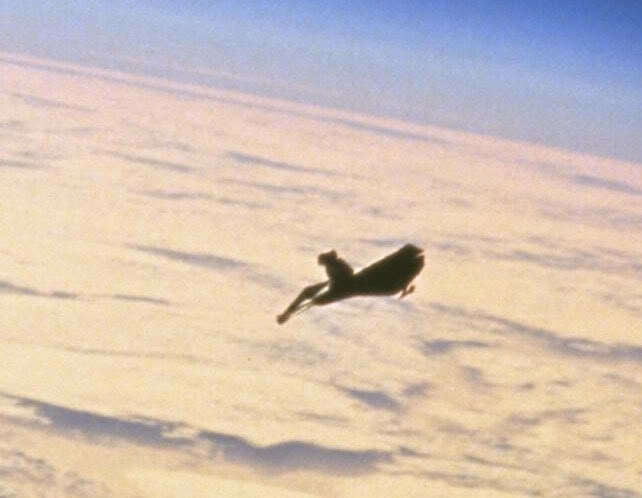 The Black Knight Satellite, along with many other objects that people have said are alien, has been seen by millions of people around the world since the ISS installed a live feed. In the new video, it has been argued that the enigmatic alien vehicles can be clearly seen and it is not a thermal blanket, which is what many skeptics have claimed it to be. Looking at the photo, the object does look strange and does not seem to look like any object that is man-made, which has been orbiting the planet. One thing is the orbit of the object, which is odd, along with the shape and the design, which is exactly what people would expect an alien spacecraft to look like. Hunters searching for UFOs have said that the object does not have any solar panels on its main body and this lead to many people suggesting that perhaps it is using and relying on a propulsion system that is unknown. While NASA generally does not open up about any alleged sightings of UFOs, when they do, the American Space Agency does tend to say that the majority of suspected UFOs are shadows, space debris or lights that have come from the International Space Station. When Gordon Cooper was launched into space in 1963, which was his final orbit, he had reported a glowing green object directly in front of his capsule in the distance and it moved towards his spacecraft. Cooper reported the object to the Muchea tracking station in Australia, and they picked up the UFO on their radar and reported it as traveling east to west. While this was picked up by NBC and they reported it, when he returned to Earth they were not allowed to ask Cooper any questions about the UFO. The official explanation that had been given about the sightings of Cooper was that he had been subjected to carbon dioxide at high levels and this had brought on hallucinations. In 1957 an unknown object was said to have been seen shadowing the Sputnik 1 Spacecraft. Reports had said that the UFO had been in Polar orbit at the time. Neither the USA nor the Russians had the technology to maintain any spacecraft in Polar Orbit. The first satellite that was Polar-orbiting had been launched in 1960. Polar orbits have been used for mapping the Earth along with observing the Earth and capturing it as time passes from one point, along with reconnaissance satellites. This means that the Black Knight is in the category of the observational satellite. However, one of the biggest questions has been who put the Black Knight Satellite into orbit and why did they put it there?